I have some issues with the current state of domestic refrigerators. Anyone who has read my other posts is probably well aware of this fact. A Better Refrigerator, The Killcap Refrigerator and Hand Crafted Refrigerators. I have a great deal of interest in the vapor compression system in these domestic machines and how I might redesign them to use less energy, but also different forms of energy. As much interest is focused on the design of the refrigerator cabinet itself. It is much easier to redesign the cooling system of a refrigerator if the entire volume of air within the cabinet is not changed every time someone wants to grab an item out of it. Instead, I think there might be ways to improve the configuration of the common household refrigerator to maintain a more constant temperature while requiring less power to do so and also make it a more practical fixture in our homes by fashioning it in such a way as to make it easier to find and retrieve items therein. I certainly don’t need to familiarize the reader with the construction of this type of refrigerator; it is surely the most common type. There really is nothing too special about it. Because it is so common and most configurations that appear quite different, but share the same problems, I will use this example to explain the problems I wish to address. The above drawings are in no particular order. I apologize for my poor illustrating ability so please, bear with me. 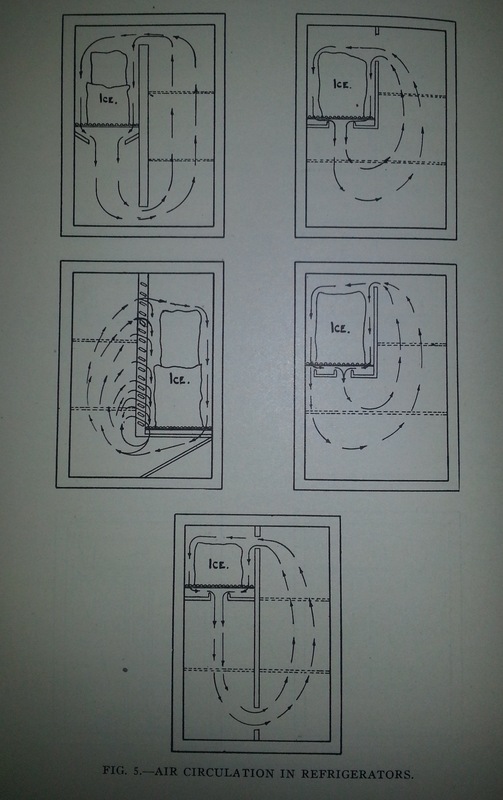 Figure 2 is the refrigerator type in question. Figure 5 is showing some of the internal construction with the compressor in a cavity below the refrigerated compartment and a “tube and wire” radiative condenser on the back. Not particularly important for this discussion, but I thought I would point it out. This swinging door type construction allows for a lot of air movement when the door is either opened or closed. Figure 3 show the door being pulled open. When this happens there is slight pressure drop behind the door resulting in ambient air rushing into the cabinet space resulting in a great deal of turbulence. As the door is further opened, the air probably slows down a bit. Once the door is opened, the cold air within the cabinet can sink and roll out of the front opening and across, say the kitchen floor (Figure 4). This of course is accompanied by ambient air rolling in towards the top of the cabinet. Closing the door, just like opening, results in a great deal of air turbulence and further exchange (Figure 1). The faster the actions of opening or closing the door, the greater the air exchange resulting in warmer, moister air in the refrigerator cabinet that the vapor compression system must cool in order to maintain the temperature of the items within. It is not hard to see the similarity between the refrigerator design and a common kitchen cabinet. Yes, at first the design appears to be convenient, but just because it is convenient does not mean it is appropriate for the task at hand: refrigerating food. The simple action of swinging a large door open or closed has devastating effects on the performance of the machine. Other refrigerator types available are the side-by-side which has been around for maybe 30 years? It is probably more convenient to use because an average sized person does not have to hunch over to see inside the cabinet. Other than that (and an ice maker), these sis-by-sides suffer from the same problems I’m trying to outline. The refrigerator on top, freezer drawer on bottom are very much the same as well. I do not own one of these “French Door” type models, but I certainly understand the appeal. Being of average height, these things are well suited to the majority of daily tasks for a person like me. I rarely get into the freezer, so it does not bother me the least for it to be somewhat inconveniently placed so that the refrigerated space is easily accessible . Making the food and drinks more accessible has positive effects on energy consumption too. By arranging things so they are easier to see and retrieve, less time is needed with the door open. Also, when the items are more accessible, it is less likely food will be “lost”, forgotten or neglected; saving a family time and energy as well as reducing overall waste. It just makes sense. Many if not all of these freezer on bottoms models have a large pull out drawer rather than the horizontal swinging door. The entire contents of the freezer are pulled out within a plastic or wire basket attached to the door supported by heavy roller slides. Again, I don’t have one of these, but I figure it’s probably pretty convenient. Because the user pulls out the entire contents to add or retrieve perhaps a single items, not only is the door opened such that there is turbulence like the other door example, but the basket and contents represent a large displacing volume which will displace a lot of air. There is the issue of radiation as well. With the drawer extended, the cold contents air exposed to the warm objects in the room by line of sight in all directions. It might not seem important, but I figure -10 degree C objects might absorb a lot of heat from a room at 22 degrees C.
I know of only one type of freezer design that doesn’t suffer from the most sever problems of combination refrigerator/freezer combo and that’s the chest freezer. Unfortunately, these are really suitable for kitchen usually. The common, cheap chest freezer can often be seen in people’s garage or basement. Because they are accessed from the top, the air inside does not get displaced as easily due to convection. Most domestic models I’ve seen have a hinged lid so there is a good bit of turbulence. This could be avoided by a sliding lid which is common in commercial units built for grocery stores and convenient store. There are some people out there using chest freezers for refrigerators. I’ve seen claims of a 90% reduction in energy consumption over a conventional refrigerator. Not exactly fair because with the chest refrigerator, you have no freezer. They are usually wired with a timer limiting their runtime or a different thermostat to keep temperatures around 5 degrees C or so. It is not hard to see why a chest refrigerator would use less power for the same reasons a chest freezer uses less. Anyone who has ever had a chest freezer knows how inconvenient they can be to find things in because food gets buried and is exceedingly difficult to organize. As a chest freezer we put up with the inconvenience because we usually aren’t in them several times a day like the refrigerator. Some folks are willing to put up a bit of inconvenience to have a lower energy refrigerator. Now this might just be my opinion, but I think many refrigerators are entirely too deep. I had a big white monster of a fridge I got for cheap and it was at least arm length deep. It got to the point where we only used the front 20cm of shelf space and everything in the back got lost. 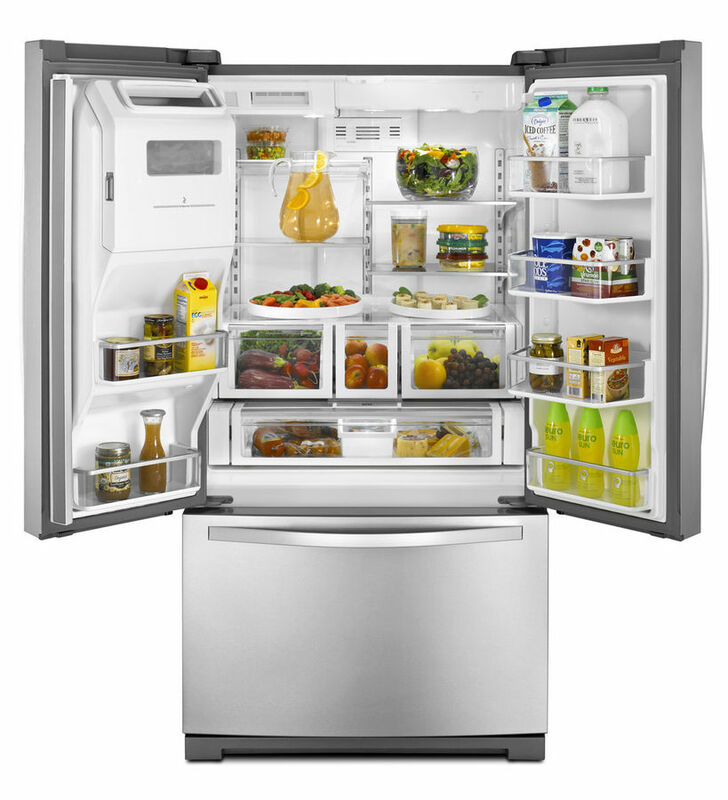 Perhaps the size of our refrigerators says something about our eating habits or diet. I don’t know; I just feel that I would spend less time with the door open and wast less food if it were easier to organize the contents of my fridge. I have considered some stacked Lazy Susan designs, but it is really not ideal and most folks probably wouldn’t go for it. Also, it’s been done before as I discovered researching ice chests. So now to the matter of improving the refrigerator door. The swinging cabinet style door should be done away with in favor of a sliding door. You don’t have to look far for examples of these such as convenience stores, bar coolers and restaurants. The reason they use sliding doors probably has less to do with energy efficiency (although many manufacturers know that commercial customers are increasingly energy conscious), than it has to do with the environment they are built for. A swinging door occupies more space while it is open which could interfere with someone else’s activity in a crowded kitchen or bar. I see the sliding door as an improvement to the domestic refrigerator that could help keep the cold air where it belongs. This could be a 2 panel left and right sliding window or even a double hung window. Even multiple small sliding windows granting access to various refrigerated compartments so as to leave the others unaffected. 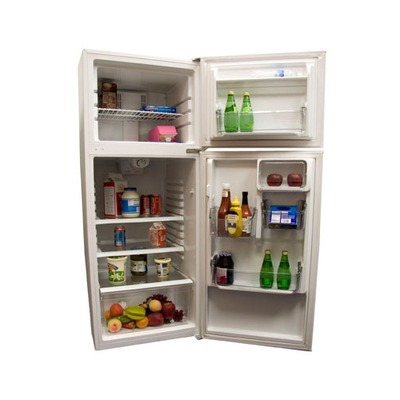 Having a clear window to the contents of the refrigerator gives the user the opportunity to identify what it is they want BEFORE opening the door. Some people may not want the contents of their refrigerator visible to all. Of course, the doors do not have to be transparent, they could instead be opaque with a solid insulation within which could surely be made a better barrier to heat transfer than the best insulating window. A tradeoff in losing the swinging door is the loss of the on door storage space where many people keep condiments and drinks. Some other clever means quick access storage would have to be devised. 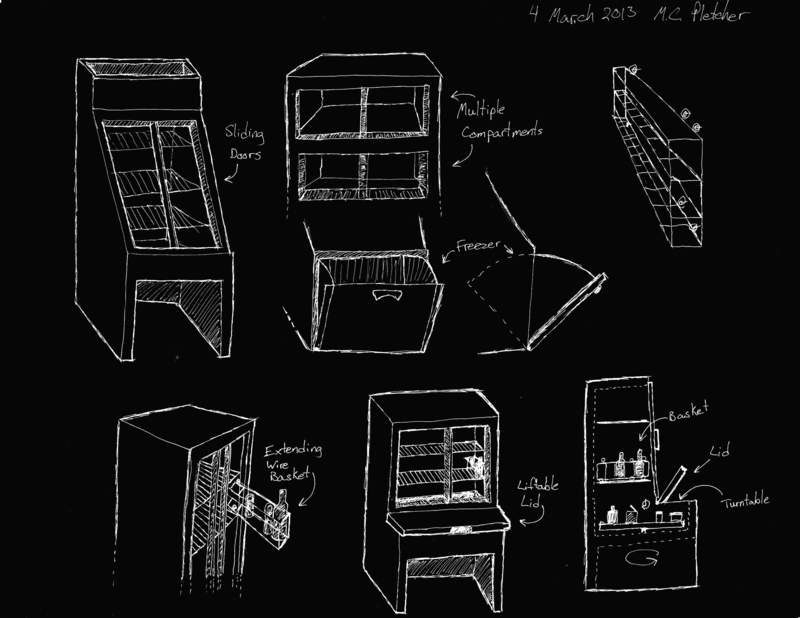 Above are some scribblings of various embodiments of a refrigerator I intend to build. These all have side sliding glass doors. The one at top left is as deep as a conventional refrigerator at the bottom, but tapers back toward the top and merely consists of three wire shelves and a space below for vegetable crisper possibly. Notice there is no freezer in that model. The freezer is proving to be a difficult problem as a I might explain later. One possible freezer space is in the center which is a “cheese wedge” hinged at it’s point on the bottom and filled from the top. I’m not at all pleased with the idea considering the displacement issues and inconvenience of items being “tossed about”. Top center is a crude illustration showing multiple compartments. Top right and bottom left show one possible solution for the placement and easy access to things like condiments using a wire basket supported by rollers inside the cabinet that can be pulled out for access. Depending on the distance between shelves it could be two levels of more. The last two drawings, bottom center and bottom right are the same basic design. It is approximately the same width depth and height of an average refrigerator. There is no freezer in this model. The depth of the space behind the sliding doors represents 50%-70% of the total depth. Below the doors, the depth extends out towards the front of the machine in an “L” shape . 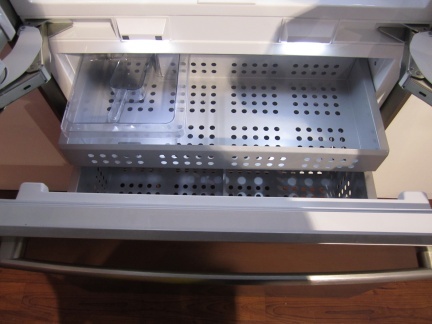 The area in the bottom is accessible by a hinged, insulated lid similar to a chest freezer. This lid could grant the user access to commonly used items that we might need for only a few moments before returning them, only to retrieve them once again later that day. The back part of this lower space is not easily accessible from the opening at the lid, but could be with the use of a turntable. The corner space unused by the turntable could be solid insulation or pockets for other commonly used items. These two volumes, the lower and upper, could be partitioned from one another so as to maintain overall better temperature. 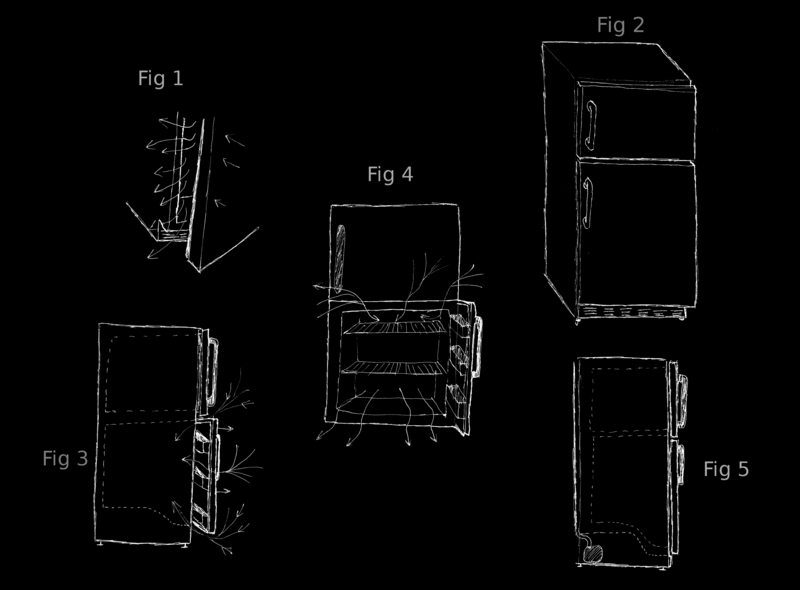 The drawing to the right shows what this design might look like with a freezer drawer. So, as to the problem with the freezer. 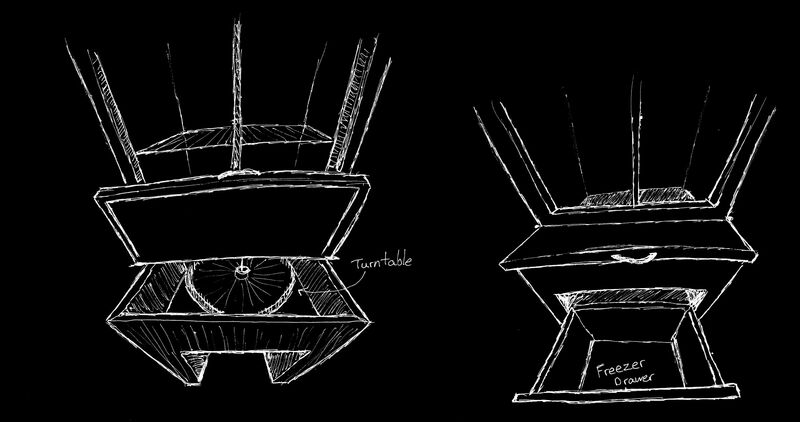 Besides finding a way to design it so that it is accessible without large heat gains every time it is opened, is the clash between making it convenient and building the whole refrigerator to be intrinsically efficient. What do I mean by that? I can rack my brain to design a vapor compression system to effectively cool any refrigerator cabinet design, but if I place the compressor and condenser underneath the unit, no matter how well it works, it is still bathing the cabinet in hot air and radiation. This is how most refrigerator today are built. It keeps the compressor protected, muffles some sound, ensures oil drains back to it and is probably viewed as more aesthetically pleasing than mounting it on top where the heat would not be as easily re-absorbed by the cabinet. If the compressor and condenser must be low in the design than the heat from it should be well shielded and ducted away from the cabinet. The placement of the freezer has an effect on the performance of the whole system, at least as far as the way I’d want to build it: SIMPLY. There is a reason why the freezer has traditionally been in the top of refrigerators for so long. 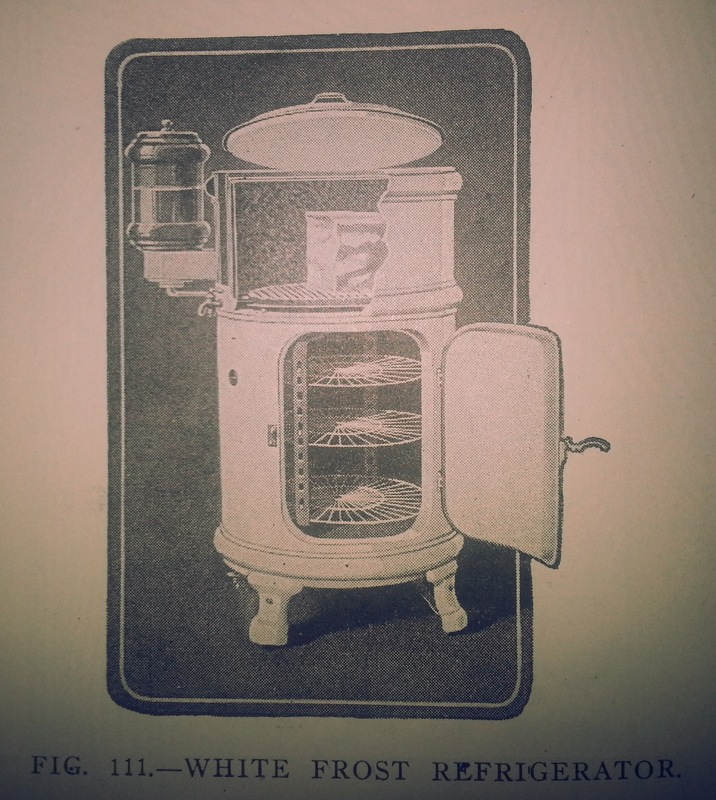 Before there were electric refrigerators, there were ice boxes. In order to get the best circulation in the chest the ice had to be high enough so the heated air from the food contents would drive a natural air circulation by convection. So, it should be no surprise that once vapor compression and absorption refrigeration became popular, that the ice block was replaced by the evaporator and this method of natural convective cooling continued on for many years. As freezer/refrigerator combos became available, so with it was the need to regularly defrost the freezer because of the accumulation of condensation on the evaporator coil resulting in longer compressor runtimes and higher cabinet temperatures. Many units today now have automatic defrost and/or two separate evaporator coils keeping the moisture in the refrigerated cabinet from condensing on the freezer coil. Also the of circulating fans today allow for many different cabinet designs including the freezer on bottom and the side by side. Fans require electricity and are often cheap, inefficient shaded pole motors. The freezer is both an afterthought and essential to the main design. My freezer is not used often, but I do need it for things like ice cubes, rice cream and cat food. I know other people make more use of theirs, so it is necessary to design this thing with freezer space equitable to an average unit. I intend to make use of a low temperature freezing brine to maintain cabinet temperature over periods of time with no input power to cool, so building that into a freezer box just makes sense. The problem is that utilizing the Phase Change Material / freezer space to cool the refrigerator cabinet is done more easily when it is above the cabinet; maybe with the use of passive heat pipes or natural circulating water in metal pipes. I’d like to avoid things like fans if possible. Another issue is the proximity of the freezer to the compressor. If the freezer, thus the evaporator, were in the bottom of the refrigerator close to the floor and the compressor/condenser were on top (to dissipate heat effectively), then the unavoidable pressure drop and superheat occurring in the suction line would decrease the C.O.P. of the system compared to a much shorter run where the proximity is much smaller. The flip up lid, designed as quick access to a refrigerated space could instead be a freezer space, but I’d rather find another solution. There’s some great pictures of old school refrigerators in some of the posts under the “Refrigerator” category.